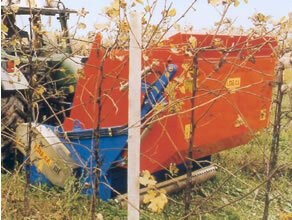 The shredder GIGANT is a machine with a strong structure suitable for cutting and collecting grass and vine shoots. Its big size rams produce such a depression that the shoots are suctioned without the rams touch the ground avoiding contacts with stones or other objects. It is available the version with container in which the suctioned vine shoots are carried inside it and can be unloaded by hydraulic cylinders movements.